The present city of Ottertail was platted and recorded on September 3, 1903. Is “Ottertail” One Word, or Two? 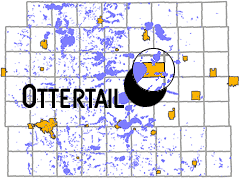 “Ottertail” is the correct spelling when referring to the city, and is in fact the ONLY government entity in the county that utilizes a single word. All the others: Otter Tail Township, Otter Tail Lake, Otter Tail River, and of course Otter Tail County have otter and tail as separate words.